Amazon Swords are actually amphibious bog plants, but most can become completely aquatic if submerged for long periods! Amazon Swordplants can grow to a maximum of 14 to 20 inches (35 to 50 cm). The leaves, being very long and fairly broad, make up the main part of the Amazon Sword plant. Their height and shape makes them ideal for background or mid ground decorations. The leaves of the Amazon Swords can, and often will, grow above the surface of the water if the conditions allow it to do so. This trait makes them very popular for aquariums with a low surface level. However if you do not want the plant growing above the water, trim its roots and long leaves periodically. Also remove older leaves to keep the plant looking healthy. Amazon Swordplants are relatively easy to keep, with a few basics to keep in mind. 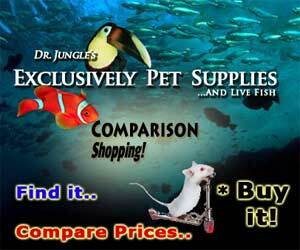 They do well in fine, iron-rich substrates, bright lighting, and fairly soft water. Be careful of high carbonate hardness levels, because this can affect how well the plant grows. They propagate by producing new shoots that act as runners and eventually separate from the plant. The Amazon Swordplant is readily available. African Cichlids are mostly rock dwellers or open water swimmers, and many do best in a rock type decor. However some of the Central and South American Cichlids do fine with plants, just read about the behaviors of each fish to make sure that your fish aren't diggers/burrowers. The selection is up to you. You can choose some tall ones for the back of the tank, like Val's, swordplants usually make good mid tank selections, and grasses and small plants like Anubias work well in the forground. I have 2 amazon swords in my 55 gal tank and they take up about a third of it each. They are a beautiful and easy to care for plant. I have about 3 1/2 inches of eco complete substrate on the bottom and 4 - 4 foot fluorescent tubes above. My 2 siamese algae eaters love lounging on the large leaves. A must have plant but they do grow quite large. I have had my two Amazon Swords in my fancy goldfish 55-gallon tank for about 3 months now and they have been doing well. All of a sudden, they both developed reddish-brown spots all over the older outer leaves. Have you ever had that happen? They have plenty of roots now and one has produced a shoot with new baby plants on it that I will anchor to the bottom of the tank as they grow larger. I was concerned there might be a disease so I cut off all the leaves with spots on them. What do you think is going on? any reply would be appreciated. thanks. I've bought about 50 amazon sword plants of two varieties....the shopkeeper said they both are same plants...but they differ from each other so much.....one has more round leaves than the other and it's taller too....I guess the taller and more round leaved plant is the real amazon sword...then what is the other one? 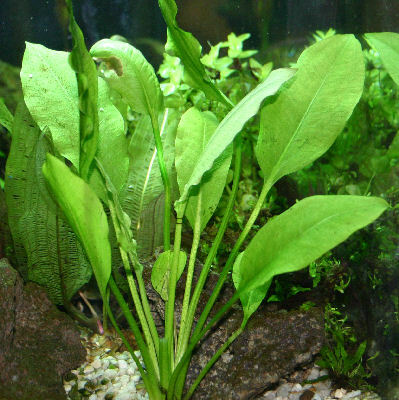 Amazon sword plants are usually grown emersed (in the air) by the nursery. The reason for this is they grow much faster because more CO2 is available from the air. CO2 is the major building block for plants. Emersed leaves have a long stem with a leaf portion that is rounded (think lolipops). When the plant is immersed in water, it will shed the old leaves and grow new ones that have a short stem with a narrower, pointed leaf portion. Growth will slow down because there is less CO2 in the water. Now you should realize that CO2 is not a pollutant, but is savored by all plant life. No CO2 = no green!